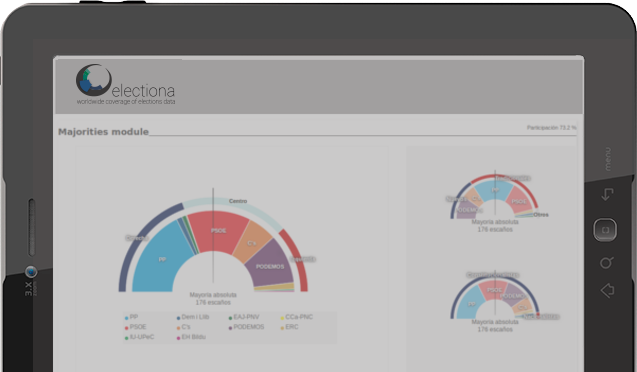 Electiona is the perfect solution for electoral information representation on real time integrated on your own website, easily, standardized and customizable. Electiona is available as a set of complementary solutions. 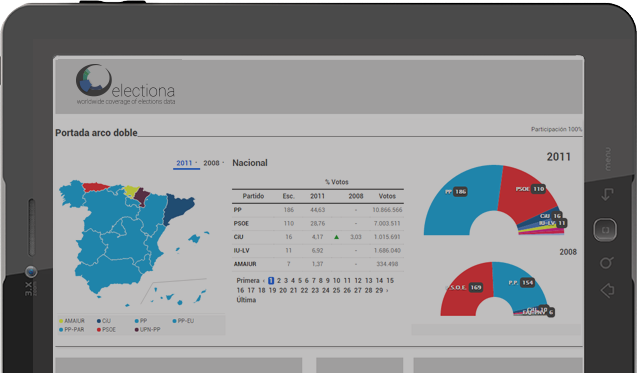 Electiona Widgets is an online graphics module, that you can integrate in an easy and simple way in your website with all the scrutiny information. 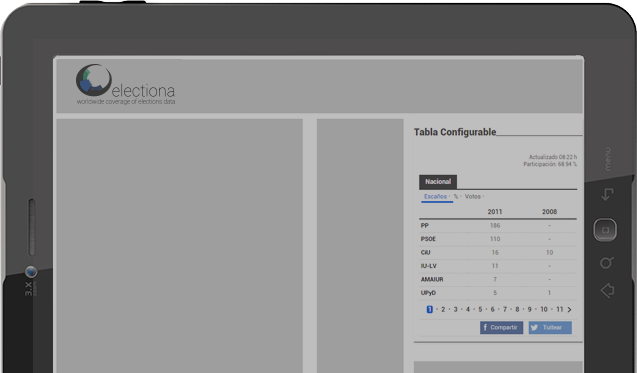 Electiona Data API provides a data API REST available as JSON file that you can use to build your own graphics. If you are not interested in any of these solutions and need a customize project, please contact us through On Premise section. 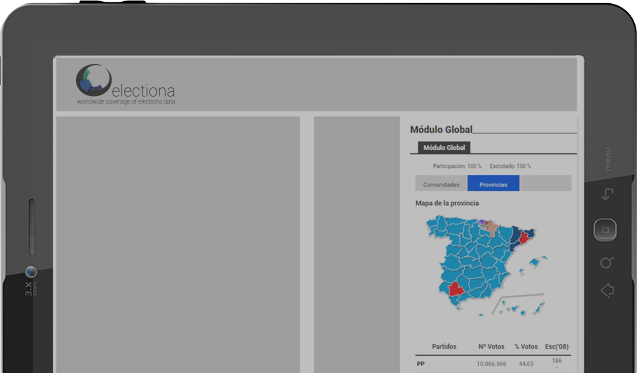 Electiona is available for different electoral processes around the world. Please, sign up and we will contact you with updates on the next processes and news. The modules are available in Spanish and English. This web page responsive approach is specially targeted at mobile devices and tablets use. Our solid state-of-the-art technology has been developed to handle a big amount of users. Available as API REST, based on JSON file. It gives services through modules and packages. Specifically designed to addapt itself to different levels of concurrency and efficiency. Electiona technology provides users with real time scrutiny data during electoral processes. Thanks to its ETL development model, scrutiny data is obtained every minute. As official institutions send us that information, we provide it to you already processed in the modules. 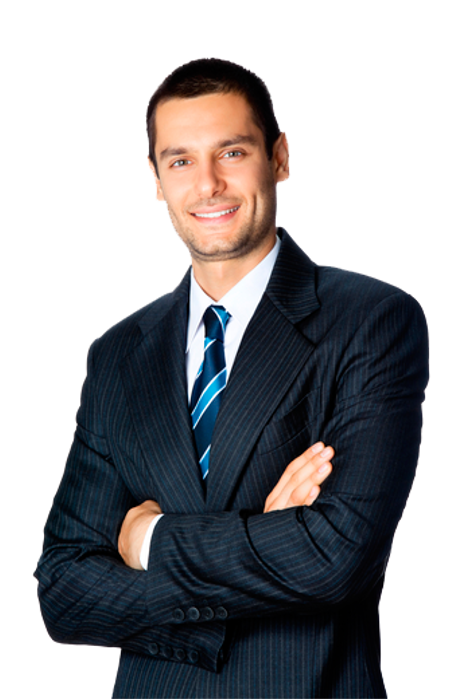 You may be able to have a very detailed scrutiny data in multiple languages only making an easy change. Who is Electiona designed for? Electiona is useful in many different environments and segments. It responds to all type of customer needs. We offer our readers online monitoring of the electoral processes along with historic information of previous elections through a simple system that can be adapted to any visual style. 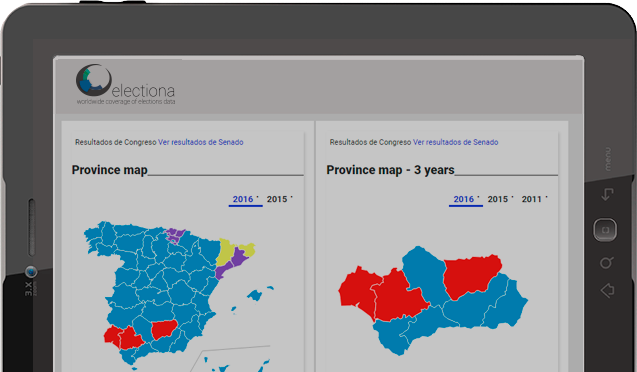 New perspectives and representation modules of electoral information thanks to the possibility of managing historic data and with comparative information between previous electoral processes with the current results. 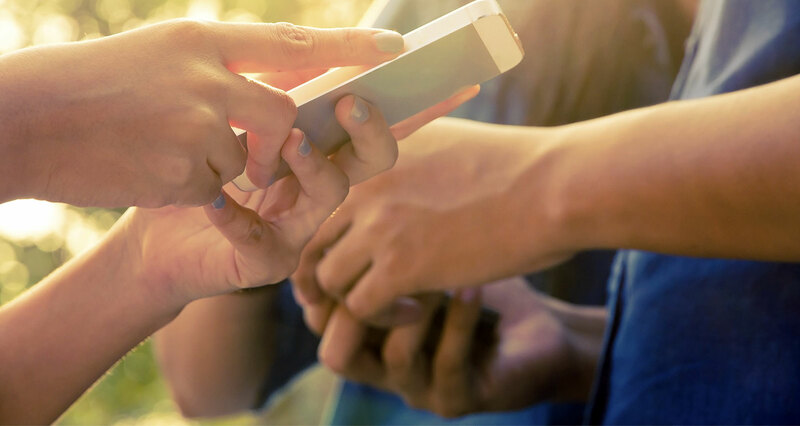 Share with citizens of municipal scrutiny with data related to their location. Electiona offers a wide range of possible configurable modules to provide users with real-time and historical data about their towns. You will have access to the most recent electoral information in your own customizable workcenter, no matter the media or electoral dates. 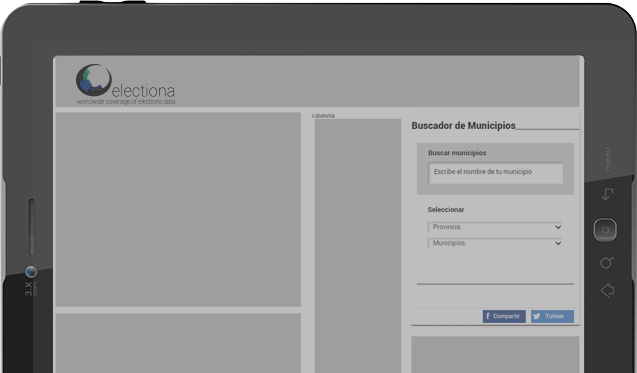 Thanks to our search engine, or thanks to our different modules of every town you can look for information of your city. It has multiple-choice of options to customize your modules in order to give different types of the results in every town. You have results of every town with graphics about them supported with tables, archs and information pannels with number of vows, etc. A very complete and navigable results. An easy way to back global and town result with a friendly sidebar that may include tables, archs and boxes of added information such as parliament seats and number of votes. 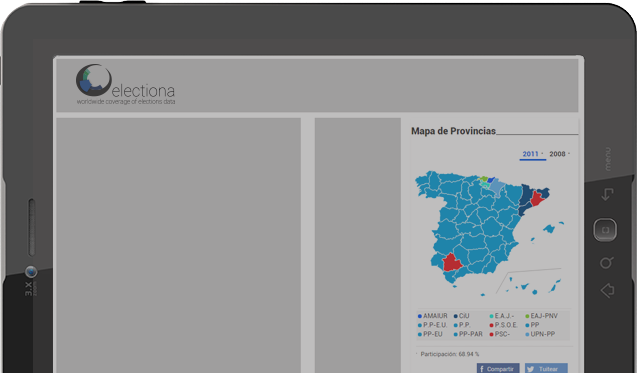 A navigable and friendly view of the results. Through a table organization of the electoral results the system gives information about the parliament seats, electoral percentage and number of votes about a specific town. This system is oriented to be display both in cities and in its whole town. Its display at a cover page has an optimal visualization. The service also provides complete coverage both in municipal and city level, with a sidebar supportive table that shows parliament seats achieved, a results rate and number of votes with the possibility of compare between two older elections result. Let you have a global review of the electoral process once it's over, allong with graphics , maps , supportive tables, comparatives, etc. It is also useful before and after the scrutiny for the comparatives.